For Laboratory Technician : Having adequate skills of using & maintaining sophisticated equipment. For Laboratory Assistant : Essential knowledge of using sophisticated and field equipment. 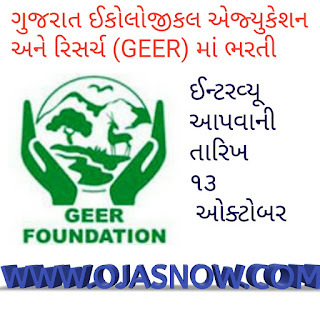 GEER Selection Process : Selection will be based on interview. How to Apply GEER Vacancy : Interested candidates may appear for interview along with Curriculum-Vitae, all original certificates, ID Proof and one attested photocopy at the time of Interview.